Safety is a must for individuals, especially for every road users. Accident, car breakdown, bad weather, and other forms of road troubles happen at the most unexpected time. Protecting and finding a way of keeping you and your loved ones safe during this period can be challenging. Having an emergency kit at hand can provide the essential items in the event of an emergency. 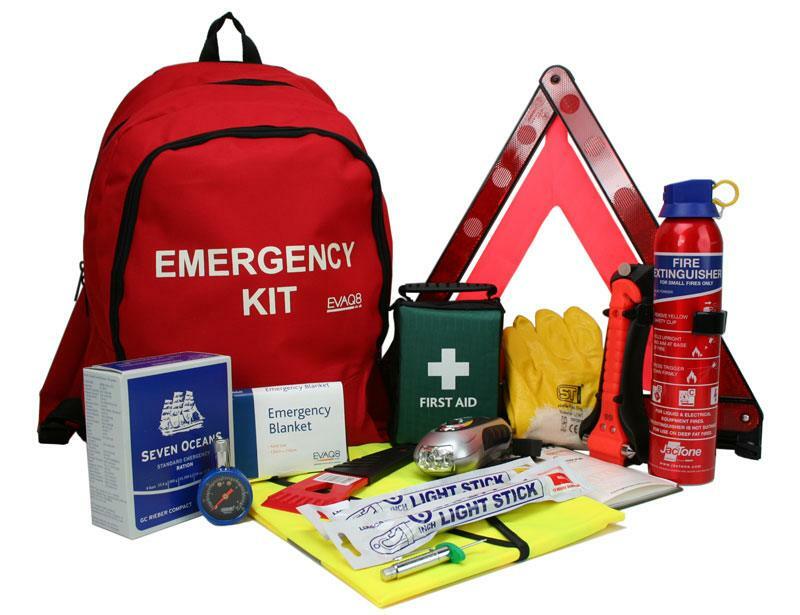 An emergency kit is a collection of necessary supplies your car may need in the event of any road trouble. The Thrive Emergency Kit is packed with 42 essential emergency supplies and 62 first aid items. The kit contains higher quality contents than most of the products on the market today. The kit case is rugged, lightweight and compact. The bag is made from 600D nylon canvas that won’t get crushed in the trunk, spare tire compartment, back seat or truck bed. The kit holds everything you need for life’s unexpected events. The Thrive emergency kit is packed with top quality competent; the booster jumper cables are made of an eight-gauge wire that won’t disappoint you during an emergency. All the components in this kit are handpicked by professionals to ensure quality. The emergency kit comes in a portable clean bag that can be stored in the car. The kit can be used as a gift to ensure the safety of your loved ones. The kit is manufactured to care for a wide range of emergency by having the essential supplies gathered in the Kit. Small, lightweight and easy to carry around the kit is the best you can in the market at an affordable price. The package can be refilled when necessary and has the right size that will fit into your car, RV, ATV, Jeep, or your Boat if you have one. 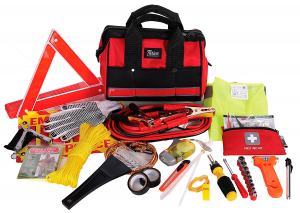 Some of the emergency items in the kit include battery booster cables, two light stick, RSV (reflective safety vest), a reflective warning triangle, emergency rain poncho, self-powered flashlight, tow rope, tire pressure, seatbelt cutter and window breaker. A multi-purpose tool like a screwdriver, pliers, bottle openers, gloves with a good gripper is also included. Some first aid items like iodine pads, adhesive baggage, fingertip bandages, antiseptic towelettes, bandage roll, accident report form, disposable gloves, small bandages and many more. If you are searching for the best emergency kit, the Thrive emergency kit is the best solution that offers a more robust and comprehensive emergency car kit. Not only that you get all the necessary items that will cater for you automobile trouble, but it also provides the materials for drivers who are stranded in adverse conditions. While it includes items like waterproof matches, toilet paper, blanket. The inclusion of a first aid kit also gives this package an upper hand over its contemporaries.